» Benchmade McHenry Williams Review – Is this a Quality Knife? Benchmade McHenry Williams Review – Is this a Quality Knife? If you’re cutting the gear you carry down to the bare essentials, the last item you’d ditch is your knife. You can do without practically everything else but a good blade is vital. It has myriad uses in everyday life; outdoors it’s your #1 survival tool. Pick the right one and it can provide you with shelter, help start a fire and give you a start at manufacturing other tools and implements. Size: Your primary knife is for cutting things; it’s a sharp, versatile tool and its main value is its ability to take and hold a razor edge. Tasks like clearing brush, chopping firewood or felling small trees need a different style of blade, and something that can handle those isn’t suitable as a main knife. So that foot-long bowie? No, too big and too clumsy. What you need is a folder with a blade around three to four inches long. Blade: The main thing to consider here is the material. Your main choices are between carbon steel or a stainless alloy. Both have their advantages, and what suits you is again a personal matter. Stainless needs less maintenance to keep rust at bay; carbon takes and holds a better edge. Shape and edge. The main factor in choosing a blade is the length of its cutting edge – shape doesn’t affect performance that much unless you need a slim point for precision cutting. In general a plain cutting edge is more useful, but if you’re a sailor a serrated section might be attractive; that style is much better at cutting wet rope in a hurry. Handle: It’s vital to pick a handle that you can hold comfortably and that gives you a good grip. Traditional and modern materials can both be great, and any quality knife should have a strong handle that won’t warp in the damp, so pick whatever feels best in your hand. It’s no coincidence that folding knives in this size bracket are the most common designs out there. There’s a massive choice of high quality blades that might suit you perfectly. Some designs stand out above the pack though, and one of the most popular is Benchmade’s 710 model. Here’s why. 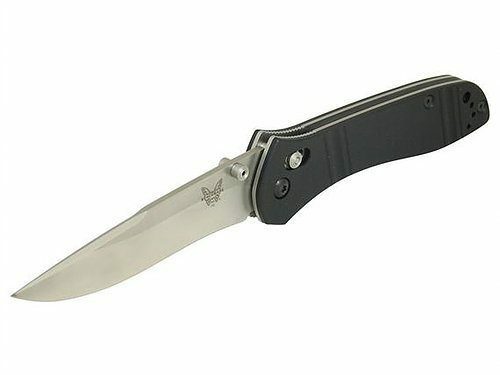 The 710 is one of Benchmade’s best known and most popular folders. 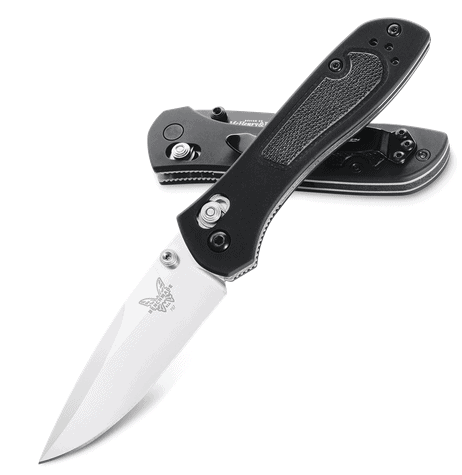 Designed by Bill McHenry and Jason Williams in 1999, it was one of the first Benchmade knives to feature the Axis Lock (which McHenry and Williams invented) and since then it’s won both fans and awards. It’s a relatively large folder, with the blade coming in at just under four inches, and that’s won it a lot of popularity as a tactical knife. The fact it’s quite light for its size is a big attraction. It’s no featherweight at 4.5 ounces but still perfectly manageable for everyday carry. Picking up the 710 you can tell right away that it was designed for practicality. The handle is built up from steel liners (they’re skeletonized internally to save weight) with flat G10 scales and an FRN backspacer. The scales are lightly textured and each have two angled grooves cut into them to add some more grip, but the handle shape itself provides plenty of that. It fills the hand quite well and the blade end has a prominent choil below and a thumb flare above. Both of these are cut with moderate jimping for some extra grip; the handle shape does a lot to prevent your hand accidentally slipping onto the blade. It’s a simple and functional-looking design but a surprisingly comfortable one. The edges and corners are nicely rounded and while the checkering isn’t very pronounced it does make it feel good in the hand. Handle: The handle also offers two retention options. There’s a lanyard hole at the back end, so you can easily secure the knife to yourself. It’s also fitted with a Parkerized pocket or belt clip, which can be fitted to either side of the handle with three screws. Like most Benchmade knives it only gives you the option of tip up carry, but that’s by far the most popular option anyway. Blade: The blade is the most vital part of any knife, and Benchmade have put all their usual genius into this one. At 3.9 inches long it’s at the upper end of what most people are looking for in a folder; if you want the largest knife that’s practical for everyday carry this is definitely one for your shortlist. The blade itself is pretty conventional; it’s a modified clip style, with a long, straight clip carrying a beveled but not sharpened false edge. The cutting edge is full length, and a slight recurve to the blade maximizes the usable length. Combined with the long clip the curve of the edge gives the blade a slim point that’s ideal for piercing cuts or fine work. Grind: The grind is slightly hollow and quite wide, resulting in a fine edge that you can get very, very sharp. If you’re looking for an absolute razor edge go for the D2 high carbon steel blade. The 710 is also available with a 154CM stainless blade, which obviously needs less maintenance, but D2 has a lot of advantages of its own. It’s famously hard but not brittle – Benchmade have hardened this one to a Rockwell rating of between 60 and 62, and not many steels can handle that, but D2 can. Putting an edge on a dull one will take some work, but once it’s sharpened to your taste it will hold its keenness extremely well. D2 does rust if neglected, so make sure to keep it dry and give it a light coat of oil when you store it, but with a quality knife you should be doing that anyway. Operation: Benchmade have a reputation for smooth knives that open easily and the 710 is no exception. The handle liners eliminate friction, while two thumb studs on the blade allow fast, ambidextrous opening. Because the handle scales are flat it can be slightly awkward to get your thumb on the studs if you’re wearing heavy gloves, but to be honest the same applies to pretty much any knife with one-handed opening – a gloved finger won’t get a lot of purchase on a Spyderco-style thumb hole either. Locking: Locking is handled by the now-familiar Axis Lock. McHenry and Williams actually designed the Axis Lock, then licensed it to Benchmade, and this knife arose from that deal – Benchmade asked them to design a new knife featuring the lock and the 710 was the result, so in fact it’s the first model to feature the mechanism (and in many people’s opinion still the best). As usual the Axis Lock is operated by two studs, riding in slots each side of the handle. It can be operated by drawing back one or both studs; when locked up the blade is very secure, with no horizontal or vertical play. Overall this is a sturdy knife that’s comfortable to use and has a lot of cutting power. It’s practical for EDC, just squeezing in under the size and weight limits most people are going to be happy with. For general cutting, as a light hunting knife or as boat gear it’s an excellent choice. Verdict: An excellent large folder, well capable of handling most cutting tasks but compact enough to carry every day. Check out the best deals on pricing here. Mora Tactical – If you want a blade this size, and EDC isn’t in your plans, you might want to consider a fixed blade. The Mora Tactical is light, affordable and its carbon steel blade takes a razor edge. Kershaw Rake 1780CB – A 3.5 inch clip point blade makes this a very versatile cutter; the finger-grooved G10 handle gives excellent grip. You can also mount the clip for tip-down carry if this is a big deal for you.